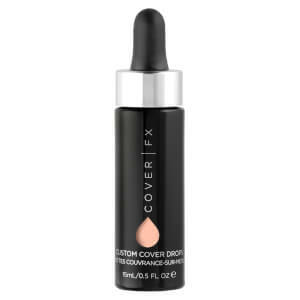 Shine a spotlight on your best features with the Cover FX Custom Enhancer Drops; a range of ultra-concentrated illuminating and bronzing drops that allow you to customise your ideal glow with a liquefied metal or sun-kissed finish. Formulated with a high concentration of ultra-refined pearls, the liquid drops boost luminosity and highlight the high points of your facial contour for a youthful, glass-like, dewy look that screams with radiance. Arriving in several glowing shades – all which take skin’s lustre to the next level. Shake well before use. For an intense strobing or bronzing effect, use alone and apply with your fingertips or favourite beauty tool. For an all-over glow, add them to your favourite liquid foundation or skincare product. The more drops you use, the more luminosity or bronze you’ll get. Hydrogenated Polyisobutene, Mica, Hydrogenated Styrene/Isoprene Copolymer, Triethoxycaprylylsilane, 1,2-Hexanediol, Caprylyl Glycol May Contain/Peut Contenir: Titanium Dioxide (CI 77891), Iron Oxides (CI 77491). Note: Ingredients may vary with shade. Receive a FREE Laura Geller Complexion Favourites Kit (Free Gift) when you spend £40. Complimentary gift will be awarded at the basket. Offer valid for a limited time only, while stocks last. Love these drops! Being a mua it can be a challenge working on certain skin types but a couple of drops of this enhancer added brightens any complexion!